These map puzzles may be hung for display. Repleacement pieces are available. 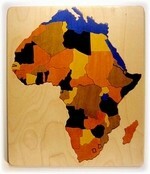 This is a beautiful map of Africa, whether you buy it in wood tone colors as a gift for adults or rainbow colors. Educational features country names imprinted on the tray and capitals on the back of each country-shaped piece. This USA Map puzzle is one of our most popular maps. The name of the state is imprinted on the tray under each state-shaped piece and the capital of each state is on the bottom side of each of the pieces. A fabulous gift for any home, school, or adult who loves geography.. Imagine - the U.S.A., made in the USA! 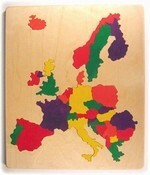 Up-to-date Western Europe map features country names on the backs of pieces, capitals on the tray. Like our other continent map puzzles, country names are imprinted on the tray and capitals on back of each piece. A great educational toy. This USA Map puzzle is one of our most popular maps. The name of the state is imprinted on the tray under each state-shaped piece and the capital of each state is on the bottom side of each of the pieces. Adults like Woodtone. 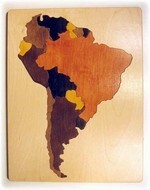 A beautiful hand cut and hand colored wooden map puzzle of Mexico, divided into states. The name of state is imprinted on the back of each piece, and capitals are imprinted on the tray.